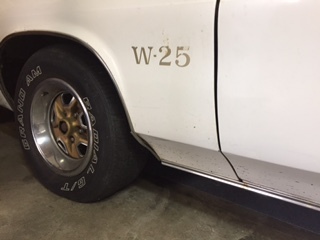 I've got a 75 Hurst Olds w25 completely original with all numbers matching but has some serious rust in the passenger compartment, rear deck, some rust in trunk and below rear window. Too bad because it's a southern car and body panels along with underneath are very solid (except the two rear floor pans). 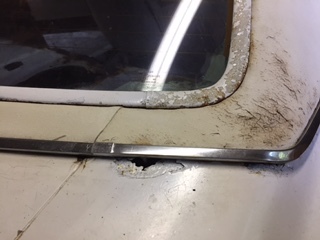 Looks like all the internal rust was caused by leaking t tops and rear window. I'm thinking it's too much to repair and would like to get money back by parting it out. Wondering how much I can get for complete almost entirely rust free nose (fenders, grill, hood, bumper, etc), running 350 engine, doors, glass, wheels (need to be blasted and painted). Rear quarters are also pretty much rust free. Also am fixing the swivel buckets which were seized but expect to get them fully functional, painted and front and rear seats re-upholstered (already bought new covers). Console is also in fairly good shape. Would appreciate any advice on whether parting it out would be a good idea. Hello there. Seems to me it depends on a lot of factors. How much do you have into the car? How attached to the car are you? How much do you think the rust repairs would cost? What's the car worth in the end after you make the repairs? Can you do any of the repairs yourself to save a little $$$? In general, G3's are not worth a whole lot to people not on this site, and chances are you'll be way upside down if you were to restore it. But if you totally are into the car or maybe have some sentimental connection to it, then it could be worth it to you. anyway, I don't know the value of the Hurst Olds' of this vintage or the parts, but they sure were cool cars. It'd be a shame to part it out, but rust repairs really add up quick. Just curious- where are you located? Best of luck with your decision. take care. Hello, thanks for the response. You're right there are many factors. I will be way upside down on this car if I fix it. I really like the car a lot, but there is no sentimental connection. I've got over $8k in the car and if I restore it right, I'll have at least $30k in it. The very best it would be worth after that is $25k. I do see from looking around that prices on parts for these cars are very expensive which is why I'm thinking about parting it out. Oh, and I am located in Southern NH on Mass border. Seems to me you're going to be upside down on this whether you part it out or restore it...just a matter of by how much. Then again, there aren't many on this site who aren't upside down on their rides. But, few (if any) have invested $30K that I know of. I just don't see where you're going to get anywhere near $8K for the parts if you go that route. I'm not an expert on these cars (although I've parted a couple of '74's) and the only things I remember that were unique to the Hurst option that weren't or couldn't be found on regular Cutlasses (and, would presumably bring a premium) were the hood, sail panel trim, dual gate shifter (if optioned), and Hurst t-tops. The W-25 engine may have been a little "hotter" than standard Olds 350...but, I don't recall. If restoration is out of the question, I'd strongly consider trying to sell it intact as a project rather than try to recoup your money on parts. If you dicide to part it out, beware that you could run the risk of selling a little and then be stuck with the rest of the parts for a long time. I mean it could take a while to sell all parts that are worth anything. And when the first parts are sold it would be hard to go back, then you will need to wait till someone buys the rest. The other Way around is that a whole car is worth more if it runs. The rust it has dosent sound that bad, most of us have startet out with something Way worse. So for a carguy that now how to do sheetmetal it Might be a cool project. Also there isens a whole lot left of them, another one dead is hard to accept. If it was me i would do what i could to make it more appealing to a buyer, without spænding a whole Lots more on it. Like put parts back on that has been taken of. Clean it up. Make it run and maybe drive. Put the new parts you have on it. Blast the wheels and spraybomb them. And so on, that Way it would be easier to sell it to someone that can see the potential. Or you could put it away until you find the time and cash to do it. Im sorry but i just hate the thought of it Being partet out cause in my World i would save them all if i could. Do you have any pictures of the car? Wow! Thanks for all the advice guys. Great points, especially about selling some of the parts and then getting stuck. I love the passion too - I don't really want to see it die either. The car does run. It's registered and I've taken it down the road. It needs brake and transmission work but engine appears to run great. 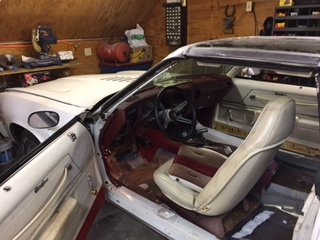 It's when I tried to get it ready for inspection and took out the interior that I found the bad news. 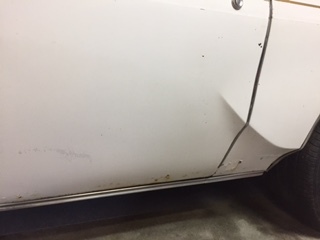 A local recommended body man quoted $3500 to weld in new metal for all the rusted areas - and that was not including the rust around the rear window. I had another body man I know very well look at it and he is the one who told me to part it out. I agree with you guys that I could do it myself, but I'm not a welder. I was thinking of trying something I heard about on line: using POR15 with fiberglass mesh. Seems crazy enough to work, except for one of the rear floor pans where I'm going to need some additional metal in there somehow to support it. I do have pics; will try to post them tonight. tommytbird wrote: I agree with you guys that I could do it myself, but I'm not a welder. I was thinking of trying something I heard about on line: using POR15 with fiberglass mesh. I can tell you this works for minor repairs. 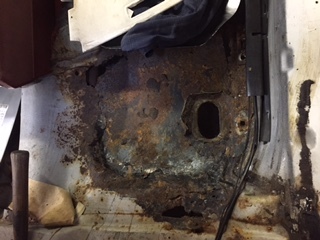 I used it on my front floor pans, which had a couple of rust cracks but not serious enough to warrant major surgery. However, there are a few steps and you must follow the instructions to the letter. It will get you a rock-hard repair, though. Just don't try this for anything structural. Hey a California parts car just showed up on this site for 500 bucks (granted you'd have to ship it to MA). but maybe you could save yours with that donor? Wierd coincidence that this site has 2 different 1975 Olds Hurst post within 24 hours of each other Fate? tommytbird wrote: Wow! 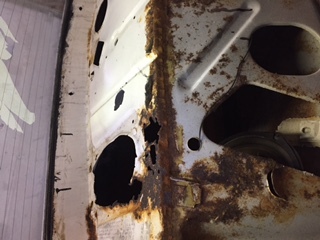 A local recommended body man quoted $3500 to weld in new metal for all the rusted areas - and that was not including the rust around the rear window. I had another body man I know very well look at it and he is the one who told me to part it out. I agree with you guys that I could do it myself, but I'm not a welder. I was thinking of trying something I heard about on line: using POR15 with fiberglass mesh. Seems crazy enough to work, except for one of the rear floor pans where I'm going to need some additional metal in there somehow to support it. Being a bodyman myself i can tell you why guys like me says things like part it out, or gives a quote that is so High. It comes Down to the fact that we make a Living repairing collision damage. Thats where the money is now a days, its also fast its in and out cash in pocket. An old classic with rustdamage is something that takes some time doing, and most of us dont have the time to take on a long term thing. But we also dont want to come off as Being unfriendly to potential customers, so it is easier to give a High quote hoping people dont take it, and if they say ok anyway at least there is a little money in it. The guy that says part it out, is really saying i dont want the job. Doing a floor job is easy but most take some time, time where you cant do collision work that pays more. And the customers with a collision damaged car cant wait so he will go else where now, but also next time he has a problem. Do i make any sense ? Its not that they cant do your floors its just a matter of business. And its hard to make a Living now a days, so we need to make every dollar count. Im still saying try and sell it as is. You wont make your money back by doing expensive floor work. Just clean it up and make it go and stop, then someone will see its potential. 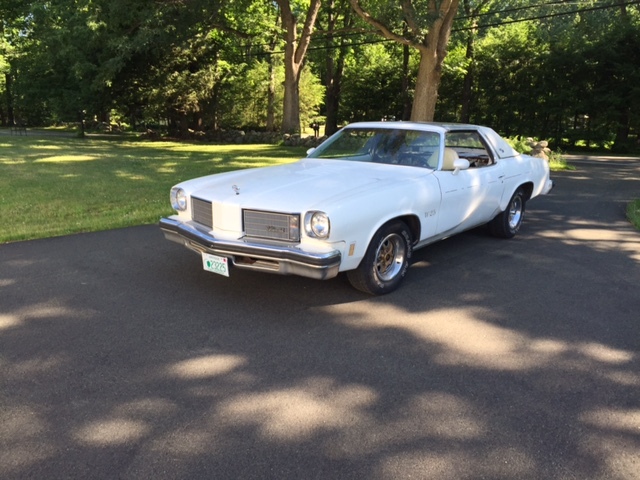 PS i forgot to mention, try and look at 73-77 olds.com and maybe try and sell it there. Looks like There is alot of action on that site. I think you explained the situation perfectly Hs1073. Thanks for the insight from someone in the business. I'll check out the olds website. Hs1973 wrote: But we also dont want to come off as Being unfriendly to potential customers, so it is easier to give a High quote hoping people dont take it, and if they say ok anyway at least there is a little money in it. The guy that says part it out, is really saying i dont want the job. a.k.a. 'nuisance pricing': "I don't want the job, but I'll do it if you pay me enough." It happens in my line of work as well. Yeah you are welcome. Im sorry it is this Way but im guessing its like this most places now a days. In the old days when i was a kid, it was normal that people Came around asking for a quote on rust repair on a 10 year old car. We would weld new floorpans in, new fenders repair doors and rear quarters, then a new paintjob. Then people would drive it 10 more years. Now a days all we do is repair fender benders which is mostly plastic, and replacing instead of pulling dents and welding rust. Most younger bodyguys dont even know how to do a prober rustjob. They get scared when they see rustet out floors, and if then there is more than that they run away screaming. The chevelle i startet out with was deamed to rusty to be saved by alot of others before i took on the Challenge. Only thing left of the original car is a and b pillars, upper part of the firewall, the roof, and sills. The rest have been replaced with fresh metal. It took me Well over 3 years to weld it back together, but i now know whats under the paint. Im super happy i know how to do metalwork myself, if i had to pay someone like me to do it, it would have been an expensive project. I hope you find someone that is willing and able to take it on, cause it deserves Being saved. I will load more - showing the rust if this one works. I've seen a lot worse. Willing to bet somebody would have the skills/resources/desire to save that one. How are the interior sail panel trim panels? I know those were a one-year only style...and, impossible to find. Oops, didn't realize they were back up top of the thread. I agree, I've seen worse -- it needs a lot of TLC, but it appears doable. OK, you guys have talked me off the ledge. I'm going to get it roadworthy rather than parting it out. Not sure how long it will take me, but the goal is to get it inspected and see how I like the way it drives and go from there. 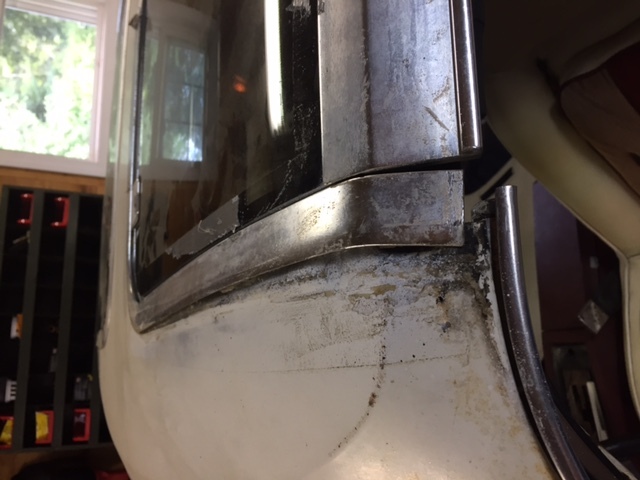 The sail trim panels are in good shape. They cleaned up real nice. White color is not completely uniform but clean and bright. Thanks a lot for all the feedback and information. I'll keep you updated on my progress. I'm looking at the pics and thinking the worst rust spots will be hidden when it's back together. It might be the perfect car to use learning how to weld. I bought a cheap little welder and have been tinkering around with a Jeep. I ran into the problems you describe with body shops and just said **** it, I'll try it myself. I watched some vids and fooled around with some small projects. On the jeep, I'm working myself up to the visible stuff. I'm hoping with a little patience and can get it done. 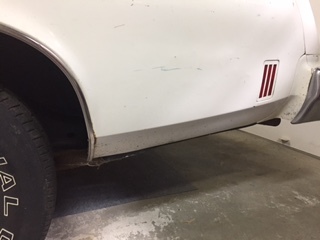 So far, it's working out OK.
By the time I do the floors in my 73 Chevelle, I hope to be a little better, but if it looks like crap, it'll be under the carpet anyway.